The American Dream of Homeownership is being delayed by many millennials according to the latest 2018 Report on Millennials from Apartment List. The majority are not prepared to purchase a home this year, and will remain renters until they are qualified to move forward. 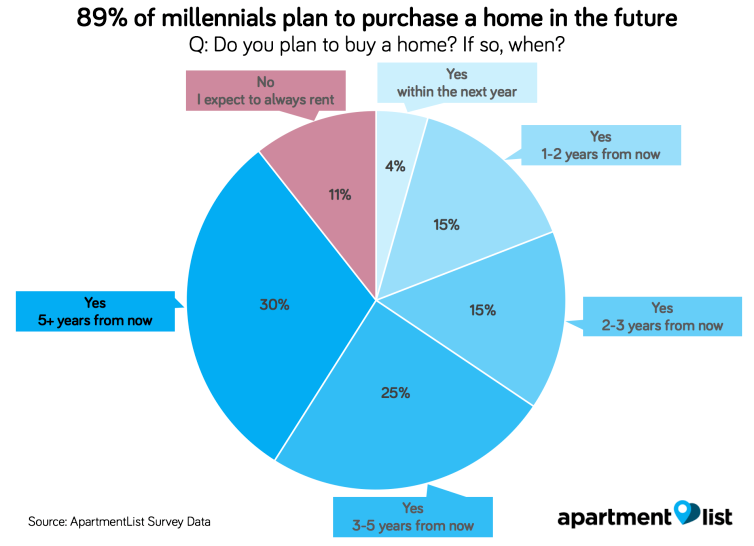 *89.4% of millennial renters say that they plan to purchase a home at some point in the future, but just 4.4% expect to do so within the next year, while 30.4% percent say that they won’t buy for at least five years. *Of those millennial renters who plan to purchase a home, 48% have zero down payment savings, while just 11% have saved $10,000 or more. *We estimate that 67% of prospective millennial homebuyers will need more than two decades to save a 20% down payment on the median priced condo in their area, while just 11% can save a down payment within the next five years. Photo imaged provided by Apartment List.